Principal at IG, Isra was featured for one year as Social Media Today’s Best thinker member. He is the creator and author of the books; Human Media, Mapmakers, Burning Man Quest, Ultraproductivity, 20 Days of Silence and Nonconformists. And also the founder of Stand OUT Program, and co-founder of Engage Worldwide, Engage Colombia, Mapmakers and IG Webinars. His blog on Digital, Marketing, disruption, lifestyle, new perspectives, productivity and change are visited by more than 120,000 people every month. Only 34, Isra has taken part as a TEDx speaker on three occasions and has participated in more than 360 industry events as speaker. At 27, he started his own agency, and has worked as consultant and analyst on new forms of online communication and marketing for other agencies and brands such as EMI Music (Spain – Portugal), BlackBerry (UK – Ireland), Disney (Spain), Ecopetrol (Colombia), MTV (UK), Lacasitos (Spain), Sonar Festival (Spain), Pioneer (UK) and blur Group (UK – USA), Amnesia Ibiza (Spain) and Music On (Spain – Italy). He has been the promoter of MONK (UK – Italy – Sao Paulo), the first Human Media Marketing agency, where he worked as Human Media Evangelist and Advisor, and is now involved as head of digital media at Bridges for Music (South Africa – India – Brazil), an international NGO that fosters and encourages change and talent. 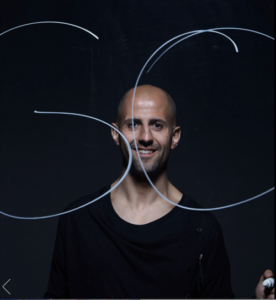 Isra has also been in charge of Marco Carola’s personal brand as one of the most influential artists in the electronic music scene worldwide. He actually advises Ushuaia Beach Hotel, named as number one most technological advanced hotel in the world.